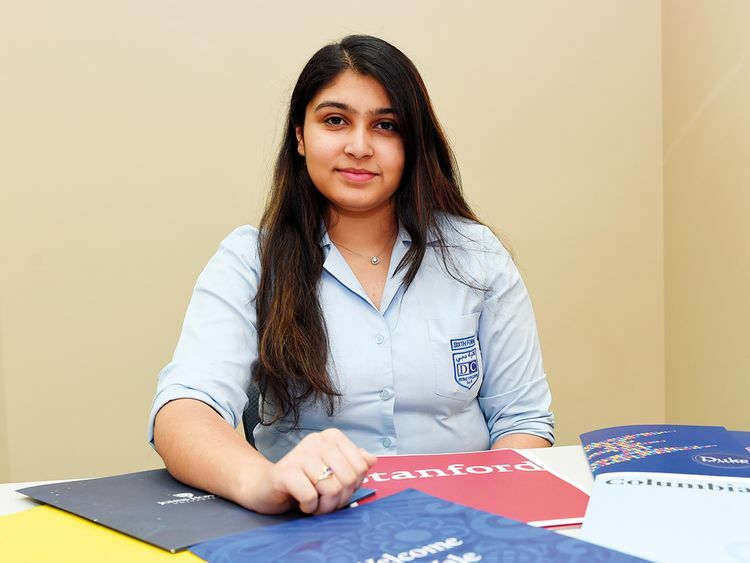 Dubai: A Dubai-based girl is faced with a problem of plenty after she received acceptance letters from 16 top universities in the UK and US, including five Ivy League schools. Alizeh Yahya, a Pakistani Year 13 student at Dubai College, who is looking at a potential career in public policy, law and politics, told Gulf News, she is overwhelmed by the response. Yahya, who secured 13 A stars in the UK’s General Certificate of Secondary Education (GCSE), topping two subjects globally in 2017, was also honoured by the UAE Ministry of Education last year for standing first in the 2015 Programme for International Student Assessment (PISA), a worldwide study conducted by the Organisation for Economic Co-operation and Development. “I always wanted to get into a top university. But I never expected I would be in a situation like this,” she said. The admissions officers of two universities even sent handwritten messages with the acceptance letters. One of them said the college was impressed by how thoughtfully Yahya had dealt with themes like “identity, subjectivity and collective memory”. “Your intellect rang out clearly as you penned your thoughts … Quite simply, you made my job easy,” he wrote. Yahya said she was thankful for her education in the UAE, where she has studied since Year 1. She said she was especially grateful to her parents and schooling for the grounding she received.